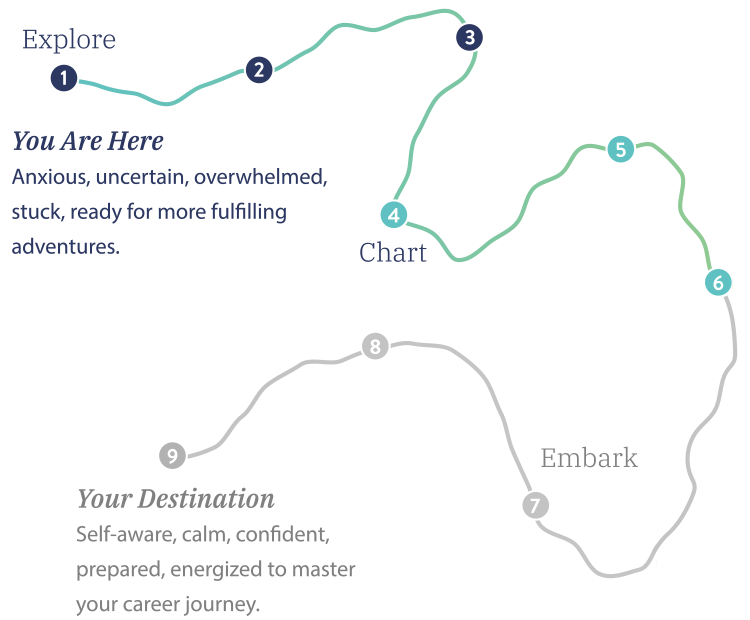 The Explore & Chart Package is my core package for women executives and entrepreneurs. It helps align who you are with the work you do—and stay connected to what you create. It's designed especially for you if you’re ready to dig deeper into your personal brand, explore what distinguishes you and clarify how to market your natural strengths and value. You get everything offered in the Gear-Up Package plus the first 6 steps of HerNature Method—Unearth Your Nature session, Set Your Sights session, Discover Your Strengths session and activities, Bridge the Gap report, Clarify Your Niche session and Get Your Guide (your own customized Personal Branding Field Guide™ for updating your resume, LinkedIn profile and other social media). You get lots of one-on-one time with Carole—4 strategy sessions—to build your confidence and identify your superstrengths. To get in on the Explore & Chart Package: Select a date and time below for your kickoff session with Carole. Enter your information. Purchase the package. And you're all set.